We have grown quite accustomed ( Boodle and I ) to seeing deer on our morning walks. The slightest rustle of leaves or snapping twig is enough to startle them - and they take flight. The most we have ever seen was 11 - all streaming across the Lane in front of us. Mothers and Babies it always seems.I have found myself wondering when the Buck would show himself...well out of this morning's early morning mist he appeared. Huge and proud and strong he planted himself squarely in our path - close enough that I could clearly see the soft down growing on his large curled antlers. I hardly dare breathe, and Buster too was entranced, he didn't bark nor hackles raise, he simply pointed. You know in the way that Labradors do - tail out horizontally and front paw raised. 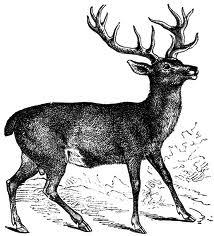 The stag blinked first - or rather snorted steaming air from his nostrils and stared deeper into us. "This stag is standing his ground" I whisper.... one final look and then we quietly turned back and went through the gate into "Dangerfield" (It's a long story involving deep camouflaged holes and stock man disappearing before my very eyes into said hole!). So here in his honour a few of my favourite stag related picks. 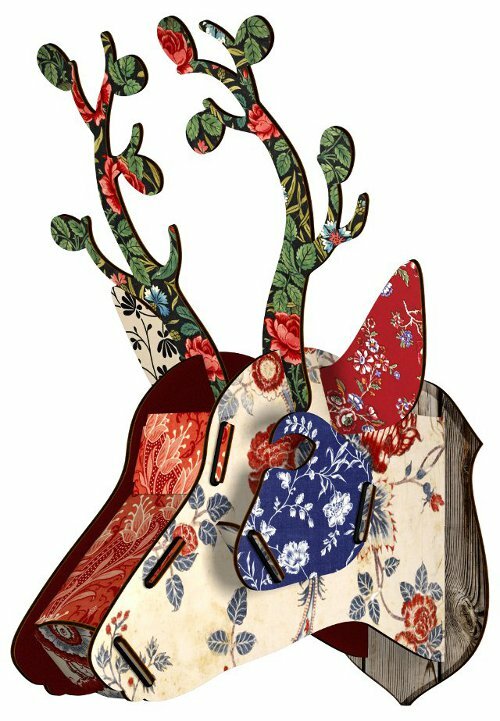 And this lovely stag built up from woodland foliage is by Millie Marotta check out her illustration and paper cuts here. 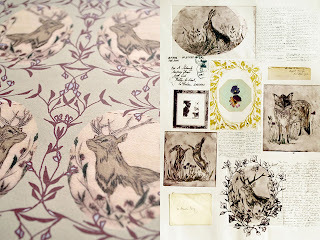 Lastly I shall be ordering some of this paper by Rachel Goodchild it's called Stags and Deer isn't it gorgeous? 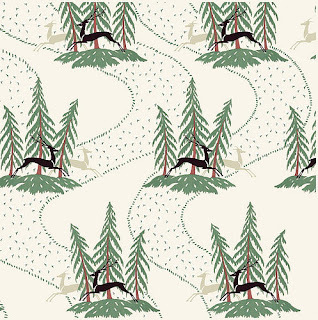 Check out her other designs if you have time here, ski school is fun too! I think that's more than enough from me on this subject, oh except....I may just have to take a little trip to a certain shopping metropolis where they always decorate with Willow Deer strung with lights. Yep, you got me, just a little place called Bluewater! He is a beauty and how honoured to be able to stand and stare for a few moments, even if it was a territorial thing. Have a lovely day and thank you.......you are so right! A beautiful post, I enjoyed every picture! 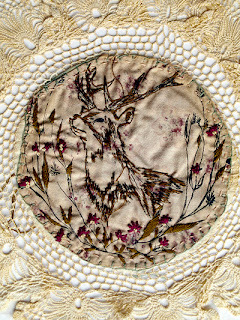 We were entranced to see a young stag in the Scottish Highlands at half term He. too, stood his ground, and wasn't the least bit bothered by us. They're magnificent creatures aren't they! It's so lovely to see them in the early morning. Oh he is a magnificent beast. We see a lot when we're down in Dorset although they're mostly Sika and I don't think your boy is? Thank you Sarah, for your lovely comment, you made me feel quite special! told jethro you needed him for mousing duty in the barn, he raced off to pack his kitty-backpack then realised he doesn't have a passport... he suggests you get a barn owl in! What an amazing sight! Slightly scary I should imagine . 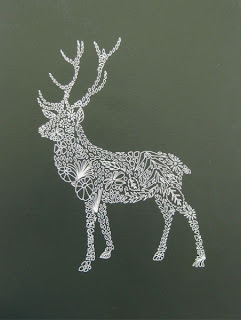 . .
How awesome to see the stag....love wall art one as well. Lovely post Sarah. What beautiful, peaceful, powerful, majestic creatures they are. Did you read Box of Delights? 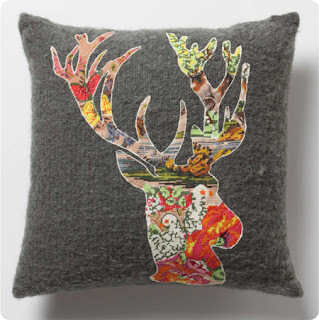 Always think of stags for some reason. I love the black and white engraving pictures. 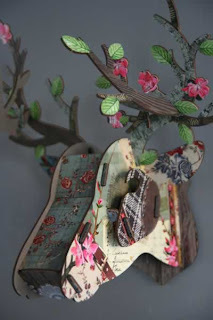 And the quirky patchwork trophy thing... I have seen them in a local shop along with some cuckoo clock style. Oh I really want a REAL cuckoo clock. It is on my life's wish list.